Other photos: Bow, Stbd Bow, Stbd Profile, Overhead, Stern, Aft Deck, Seating that Converts to Sunpad, Aft Deck Forward, Fridge to Port, Grill, Ice Maker to Stbd, Upper Salon 1, Upper Salon 2, Upper Salon Port with Dinette, Upper Salon Stbd Entertainment, Pop-Up Sony TV, Helm, Helm Seat, Electronics, Electronics 2, Sunroof Open, Sunroof, Upper Salon Facing Aft, Lower Salon Entrance, Lower Salon Entrance 2, Lower Salon Forward, Lower Salon Aft, Sette to Stbd, Expandable Table, Galley to Port, Large Sony TV, Master Stateroom Aft with Head, Queen Berth, Master Stateroom Forward, Vanity to Port, Washer/Dryer Combo, Master Entrance, Lower Salon Forward, VIP Stateroom and Head, VIP Stateroom, Queen Berth, VIP Port, VIP Stbd, Shower to Port, Head to Stbd, Lower Salon Facing Aft, Bow, Bow, Bow 2, Sun Pad, Sun Pad Back Rests, Radar and SAT TV, Radar and SAT TV, Engine Room Entrance, Kohler Generator, Engine Room, Engine Room, Engine Room, Engine Room, Engine Room, Engine Room, Manufacturer Provided Image. 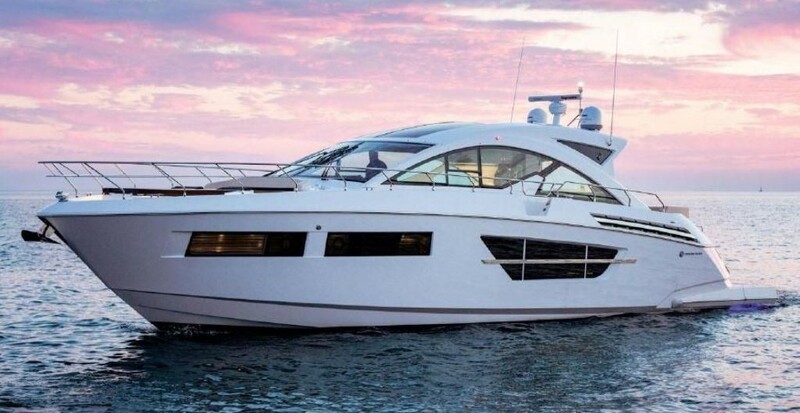 "B'Shert VII" is a beautiful, one owner Cruisers 48 Cantius 2012. She has only 140hrs original hours and has never been slept on. The seller has taken meticulous care --- full detail and wax 3 times a year and oil serviced annually. You won't find a cleaner 2012 on the market --- this one is truly mint and shows like new. Bottom was last done in Spring of 2018 with Prop Speed applied to Pods..